Nova PA600 is a solid and very strong power amplifier of high quality. Every detail of the amplifiers design is carefully considered. From the huge toroidal transformer to the advanced hybrid cooling system. Focus from conception was on sound quality and performance. This is the amp for the serious user who will play loud and clear without regard to physical limitations. We encourage you to study the Nova PA600 carefully and compare it with other manufacturers’ models. It is our belief that you will find the Nova PA600 superior. The cornerstone of any amplifier is its power supply - the transformer. Is the transformer weak and under-sized or just of poor quality the whole amplifier is compromised. Nova PA600 is equipped with an over-sized hard wound silicon steel 750 VA toroidal transformer. It ensures that the supply voltage to the amplifier outputs remain stable even during extended extreme usage. The output stage design is puristic without redundant components in the signal path. Even the smallest detail is carefully considered to achieve the goal of high sound quality and performance. To enhance audio quality the output circuitry is separated as a dual mono construction. Each channels power transistors has their own circuit board and heat sink in either side of the amplifier. Nova PA600 has a superior bass control. You will experience that bas-beats and electric guitar riffs are clearly defined and you can hear how the woofer cone is kept in an iron grip. The base is free from uncontrolled rumble and muddiness that you might have experienced with other amps. Typically, an amplifier is based on one type of cooling, either passive or active. Passive cooling means that heat from the power amp is dissipated into an aluminum heat sink. This is done by passive convection (the natural law that hot air rises). This type of cooling is common for traditional hifi amplifiers. Active cooling increases the cooling effect by using fans to force air across the heat sinks. Since Nova PA600 is designed to function optimally in all environments, it was necessary to develop a more sophisticated cooling system. It would be a cooling system that optimizes the advantages of both passive and active cooling, without the associated drawbacks. The result of this development is an advanced hybrid cooling system. The hybrid cooling system has optimized the natural convection (known from the passive cooling method) by incorporating large extruded aluminum heat sink for each channel. This provides a large surface area, so huge amounts of heat can be removed. A unique design feature of the hybrid cooling system is how the whole chassis is transformed into a giant secondary heat sink. This is done by a thermal coupling of the extruded aluminum heat sink to the chassis. No matter where, when and to what you want to connect your Nova PA600, it has the right inputs. It is equipped with both RCA, XLR and ¼ "jack. RCA is the typical connection in a normal home setup. XLR is used mostly in professional environments. The ¼ jack is typically used by musicians. This flexibility makes Nova PA600 the optimal amplifier solution whatever the circumstances. Nova PA600 is equipped with extensive protection and instrumentation. Instrumentation provides real-time insight into the amplifiers operation. Dual VU meter with five green LEDs per. channel shows the current output power. A peak indicator circuit activates a yellow LED (per channel) when the amplifier's output stage is within 1 dB of full power. When overdriven the amplifier's intelligent anti-distortion circuit will subtly reduce volume. It enables the user to use the amplifier's full power without concern for distortion. This means that the amplifier can run at its absolute max limit continuously. A red LED above the on button indicates the amplifier is switched on and amp high voltage supply is online. A red LED for each channel lights up if the protection system has observed an irregularity, such as shorted speaker cables. Nova PA600 is further protected against short circuit, transistor burning and internal faults (open circuit). It protects your speakers against harmful DC, RF burnout and on / transients (prevents the amplifier from making loud noise in the speakers at start up). Some audio products do not provide enough voltage to drive a power amplifier in full output. Nova PA600 is equipped with enhanced signal-sensing technology. This technology makes it possible to drive the amplifier to full power with an input signal as low as 60 millivolts. This means that in principle you can put an iPod or computer directly to Nova PA600. Everyone is interested in saving power. Both for the environment and your wallet. Our engineers are very environmentally conscious and from Nova PA600's conception, environmental awareness and efficiency were absolutely essential.. A combination of innovative technologies and extreme precision with tuning and calibration led to Nova PA600 is the market leader in Green Power. Nova PA600 is so sensitive that it automatically starts when it receives a signal and automatically falls asleep when the music stops. When the amplifier is asleep it uses almost no power. This feature can be manually turned on and off. Thanks to the unique hybrid cooling system Nova PA600 is one of the only high power amplifiers not wasting energy on constantly rotating fans. Some power amps have fans consuming upwards of 35 watts constantly. Nova PA600 is designed to be bridged, that means the amplifier's two stereo channels are merged into one mono channel with double the power. This ensures unlimited power reserves to even the largest speakers. 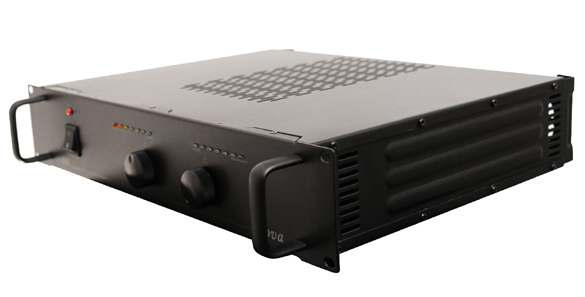 Nova PA600's over sized power supply, output stage and cooling makes it able to run bridged even in 4 ohms In comparison to many other amplifiers, which only tolerate bridging at 8 ohms. To send malicious DC out to the speaker. To send a clipped signal to the loudspeaker. This function can be manually turned on and off. Power transient (prevents the amplifier from making loud noise in speaker on start up). 1200 watts into 4 ohms bridged dynamic. 2 x 600 Watts RMS at 2 ohms, both channels driven dynamic. 2 x 400 Watts RMS into 4 ohms both channels driven dynamic. 2 x 240 watts RMS into 8 ohms both channels driven dynamic. 600 watts RMS into 4 ohms bridged continuously. 2 x 300 Watts RMS at 2 ohms, both channels driven continuously. 2 x 200 Watts RMS into 4 ohms both channels driven continuously. 2 x 120 watts RMS into 8 ohms both channels driven continuously. Can be mounted in a standard 19 "rack and is two unit high. Multiple amplifiers can be stacked on top of each other. Can stand at the bottom of a stacked system. Dimensions (HxWxD): 9 x 48.3 x 39.2 cm.